You can’t beat this for originality, surprise, and being a first. 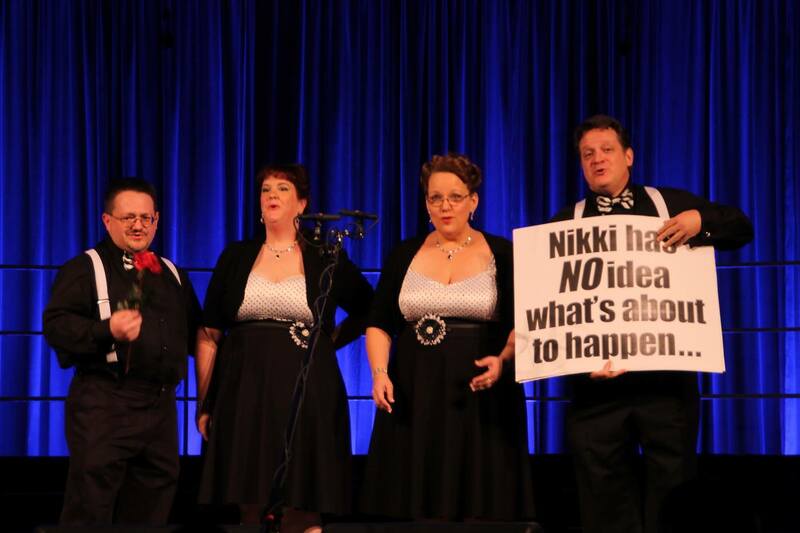 It was a well guarded secret that the Mixed Quartet Contest recently held in the Southwestern District was going to have a BIG surprise ending. The SWD is one of the first districts in the Society to jump onboard and include MIXED quartets (men and women) as part of its fall convention. 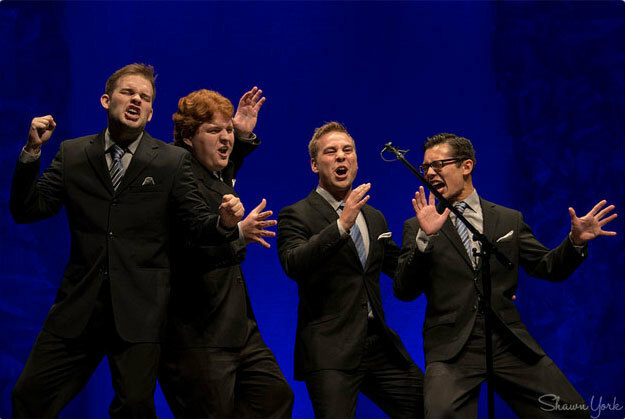 Already very popular in Germany, the new genre is finally starting to take hold in the Barbershop Harmony Society. Dallas Big D Chapter music director Terry Chapman sings baritone in a pick-up mixed quartet named Three Is The Loneliest Number. He formed it with Laura Jenks, Texas Harmony (SAI Region 10) member, Tim Bird, Town North/Plano Chapter music director, and Terry’s girlfriend Nikki Edwards. They quickly organized their foursome after learning of the new contest addition to the SWD fall convention. But Terry had an ulterior motive. He was looking for a unique way to propose marriage to Nikki. With a LOT of help, Terry organized and planned this surprise and managed to keep Nikki in the dark. The day arrived and they were introduced as the last quartet of the contest and came on stage with very few knowing what was about to happen. And what was about to happen was a historical FIRST for ANY BHS contest. During Sweet and Lovely, their second song, Terry offered Nikki a rose. She was fooled into thinking they would do a bit where they passed the rose back and forth depending who was singing the lead part and Tim (on the other side of the quartet) would be holding up large signs explaining the bit to the audience. What she didn’t know was that the hand held signs told the audience of Terry’s upcoming marriage proposal at the end of the song. ...and wanted to do something VERY special. ...but Terry is proposing to her at the end of this song! This has NEVER happened before at a BHS contest! Please hold your applause until after he presents her the ring. Then watch history ... and HERstory... being made! The song went just as he planned; Terry dropped to one knee and popped the question to her excited shock and total amazement. Several co-conspirators played important parts in the surprise: Anthony Bartholomew, Tim Bird, Laura Jenks, Randy Rensi, Steve Stripling, their parents and several others. Oh, by the way . . . She said YES! 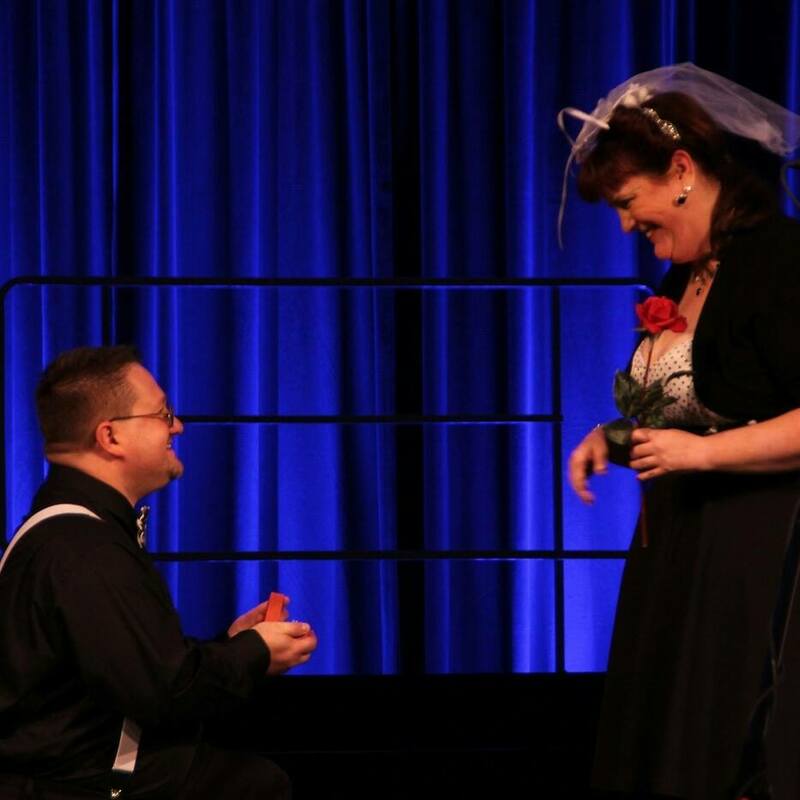 The quartet placed 6th, won the audience and was awarded with a spirited standing ovation and one of the most unique memories as they begin their lives together. Our congratulations to Nikki and Terry. We all wish them perfect harmony, perfect pitch, and many years of joy.